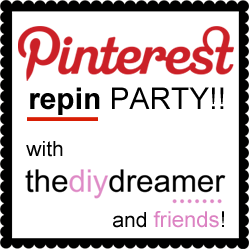 Welcome to the Pinterest REPIN Party!! Pinterest is a WONDERFUL tool that can bring in LOTS of traffic to your blog. Do you have a fabulous pin that you would LOVE to have repinned on Pinterest to bring in some more traffic? If so, this is the link up for you! You get to link up your favorite pin and in return you get at least 9 repins, 7 of which will be from the hosts!! 1- Repin the hosts Pinterest pins in the link up. (They would be the first 7 link ups) OPTIONAL (It would be greatly appreciated!) – Follow your hosts Pinterest pages: The DIY Dreamer – twelveOeight – Love and Laundry – Mommy Made – Polkadot Pretties – Life Created – Leen Machine Paper Studio2- Link up the Pinterest url of what you would like to have repinned (only 1). (The url of your pin. Example: http://pinterest.com/pin/82894449362915069/) 3- Repin the 2 link ups before you. Feel free to repin as many as you like, I’m sure most will return the favor!! 4- Grab the button below and place it somewhere on your blog and/or share this on Pinterest, Facebook, Google+ or Twitter! 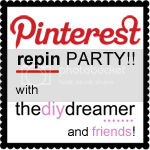 Have fun with the Pinterest repin PARTY!! !We can’t wait to see all the pins! Hi! I found you via the Pin Party and I am now following you via GFC, Pinterest, Twitter, & Facebook. An outstanding share! I have just forwarded this onto a colleague who has been conducting a little research on this.